This weekend I celebrated the end of summer and the start of the Fall flying season with a short cross-country flight. The combination of beautiful views of the fall foliage from above, smoother air and fewer concerns of a weather related flight cancellations makes Fall my favorite time to fly. The only downside of the start of Fall is we start rapidly losing daylight flight time. I blocked a Cessna 172 for a few hours on Saturday afternoon. The weather was nearly perfect with cool temperatures and winds reported as light and variable at my home base airport, Chicago Executive (PWK), and at my destination Beloit (44C). The only negative to the weather was a layer of haze that degraded my visibility a bit as I flew towards the sun on the first westward bound leg. Beloit is just over 50NM miles making it probably the closest airport to Chicago Executive that you can fly to and still log the time as Cross Country time. 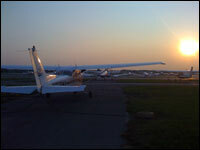 Beloit Airport is on of those quiet country airports. It has a single paved runway that is 3,300 feet long and only 50 feet wide and no taxiway. The flight to Beloit came in right around 35 minutes. From looking at my sectional I had seen a reference to frequent glider activity in the area. When I arrived in the area though I appeared to be the only aircraft in the area. On the ground sure enough there were 20-30 gliders resting on the lawn. With light winds landing on the centerline of the narrow and short runway was not a problem. As there did not appear to be any activity or people to speak with I simply back taxied down the runway and turned around for the return flight. I had an equally uneventful flight home. Without the sunlight fighting its way through the haze I had much better visibility. As I arrived back at Chicago Executive I noticed a familiar voice on the radios. Turns out John of FlyingChicago.com was in his Mooney following me into Chicago Executive. I caught up with him later in the weekend. Turns out he had flown by Beloit during the day while visiting Dubuque (KDBQ) and Cassville (C74). Looking for somewhere to fly this fall? Check out John's site at FlyingChicago.com. Fall has always been my favourite time for flying. Odd that it took you 47 hours and $4500 to earn your license, but John has it at 68 hours and between $10,000 and $12,000. From what I've heard and read, your figure is more likely. Where does he get his price tag from? Chicago more expensive? Unfortunately, the price will vary from pilot to pilot. A lot of it depends upon how often you can fly. I was flying 2-3 times a week and was able to do it in just over the minimum number of hours which saved me some money. I actually did my training in Ohio which had cheaper plane rentals and flight instructor rates. So in general John's estimates might be more accurate for Chicago. But, you can look around and find cheaper aiports. Thanks for the response. I've heard that the amount of time it takes is relative to how proficient you are. I'm actually not that far from Lincoln Park in NJ and read your "Glass Cockpit" posting. The cost of training is going to vary widely. The $10-12K number is based on training in Chicago and nearby suburbs. Aircraft rental here with an instructor is around $140-180/hour. As Todd mentioned, a lot of it will depend on if you are able to fly often and keep your training moving forward. Many students have to take a break in the middle (life happens). In those cases their costs goes up. Just make sure to budget enough so that you don't have to take a break because of finances.